The following post is sponsored by Vital Proteins. Thanks for Reading! Over the last couple of weeks, I have begun to incorporate Vital Proteins into my diet. We are now in what is known as the "holiday" season. Every corner that I turn, I spot another pumpkin pie or tray of cookies. I am very aware of what I should be steering clear of, however, with so much good food around (and the fact that I work in a food LAB), I was in need of some extra help in curbing my craving for these decadent delights. It is important to start your day off on the right foot. If you are like me, you usually wake up and eat perfectly until 10 am. Then, something happens. You're at work, and all of a sudden, all those "fringe foods" start to look delicious. These are unplanned foods that go straight into your mouth and stick to your hips - forever! Pour the collagen peptide infused blueberry Greek Yogurt into a bowl, and top with your favorite exotic fruits. These tropical exotic fruits complement the tart yogurt perfectly. 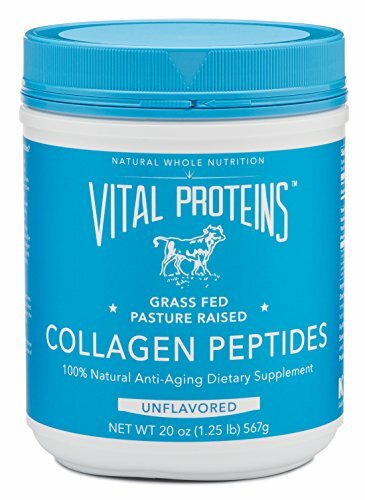 The collagen peptides are instantized, so they dissolve very quickly into the yogurt mix. They are taste-less, so no need to worry about any off-flavors. If you kick your day off with this bowl, you will be packing 42 grams of protein during the most important day-part. My Daily Reference Intake (DRI) of protein is about 46 grams (.36 grams protein per pound of body weight). By taking in a large amount of protein in the AM, I am far less likely to want to snack at 10 or 11. Since incorporating Vital Proteins into my daily routine, i have been feeling more full throughout the day. I will be heading to San Diego at the end of December (Hellooooooo bathing suits! ), so Vital Proteins is exactly what I need to transform into a leaner version of myself.